A daily snapshot of variances and sales progress based on your daily averages. 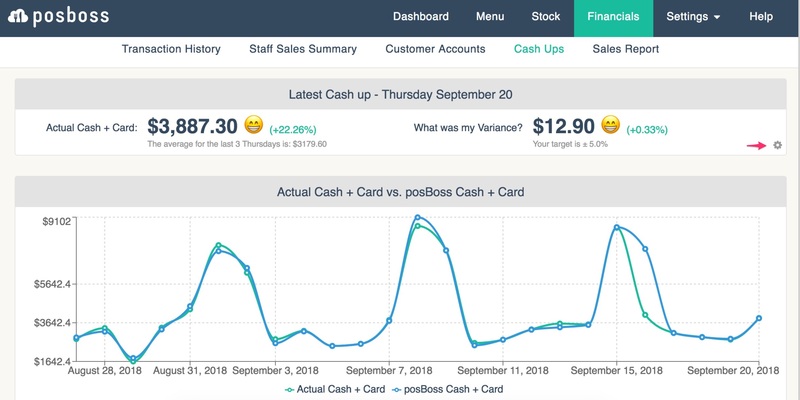 The posBoss cash up graph tracks your sales progress based on an average of the same day over the past three weeks. It also display's your variance, immediately pointing out if you are outside of your chosen margin. The cash up graph is part of our Control plan add on. The example above shows that todays cash up is well above the average of the last 3 Thursdays (by 22%). We have also set up that we want to see 1% growth, and so it gets a smiley face. On the top right is your variance from the last cash up. It's matched against the percentage of variance you have decided is acceptable, allowing you to immediately see if you need to investigate further. In the example above, we have set a +/- 5% acceptable variance. The variance in this cash up is +0.33 so is within the margin and gets a smiley face. Over to the right, you will see the settings button. Press this to set your margins. And press the green tick to save. At the bottom you will see the variance trend graph. This is based on the cash ups that appear on the page below. It displays your day to day takes and any variances. Want to be more in Control of your business? Upgrade to Control now!